When I was a little girl in Ireland I loved making daisy chains, just like many generations of little Irish girls before and after me. But why, you may ask, am I day dreaming about daisy chains in the middle of winter? Well, this week I watched a beautiful short film, called The Daisy Chain, created by Ken Williams and Denis Fitzpatrick. Ever since I watched this short movie, I just couldn’t stop dreaming of childhood days of summer and linking daisy chains in the fields on my granny’s farm near Skibbereen. The Daisy Chain, a poignant, reflective drama was shot in Schull in West Cork in July 2013. The filmmakers chose Schull because Ken Williams wrote the script for a Jim Sheridan Masterclass at the Fastnet Film Festival earlier that summer. Luckily this movie has now been made available for viewing on YouTube. I highly recommend taking a peek. It’s just over 5 minutes long and I confess, it brought a tear to my eye. A happy tear, as it kindled childhood memories of West Cork, and of daisies, buttercups, dandelions, and all the wildflower games we played as children. And so here it is, the remarkable little movie, The Daisy Chain…. Narrated by the Irish actress Fiona Shaw and co-directed by Ken Williams & Denis Fitzpatrick, this beautiful film was selected to screen on RTE 2 Television in Ireland in June 2015 on their program Shortscreen. The Film has been viewed and appreciated by film festival viewers all over Ireland, and in Boston and London. It was officially selected at all the following film festivals …. It was also nominated for the Best Original Score at the Fastnet Film Festival. Fast forward 11 months to May 2014. The Daisy Chain had its Irish premiere in Schull. The very same day Ken Williams’ wife gave birth to their first child. A baby girl, called Daisy! Isn’t Daisy adorable wearing her very own daisy chain! And so, as we weather the bleak, dreary days of January, let’s dream of summer days and linking beautiful daisy chains once again. 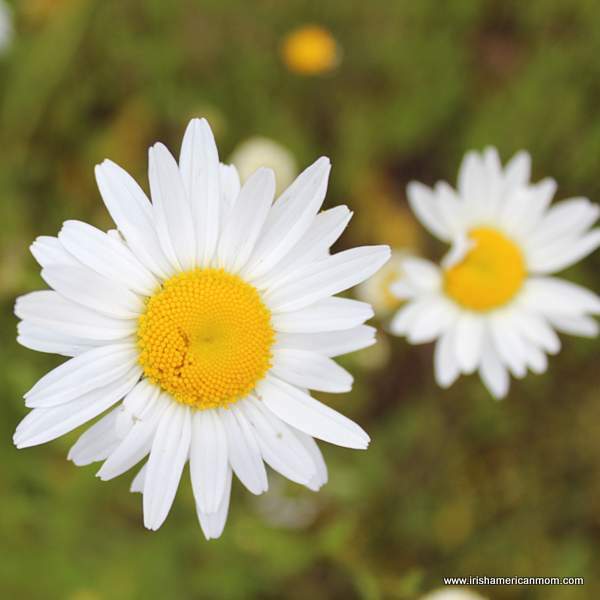 This summer take your children to the fields to gather daisies by the dozen. Teach them to gently pierce the daisies’ stems with a fingernail, and to delicately pass the stems through each loop. Daisies need to be handled with care, but please do pass on this traditional skill, so that little girls may continue to enjoy wearing daisy bracelets, necklaces and crowns for many summers to come. P.S. 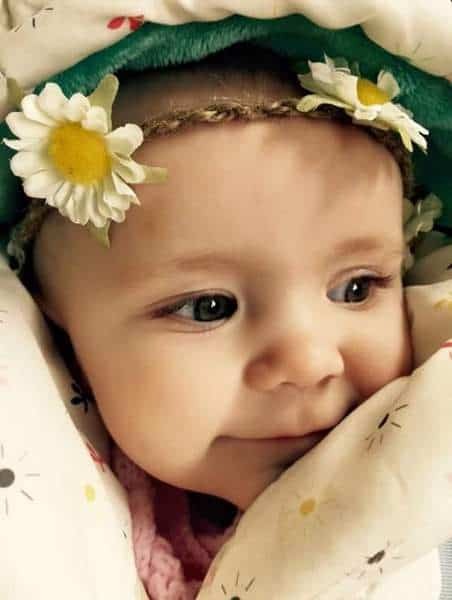 A big thank you to Ken Williams for sharing his short film with us today, and for granting me permission to share this beautiful picture of his little girl. That short film brought up many happy memories to me, I made loads of Daisy chains when I was a child, very happy days , i still make them for my grandchildren ? 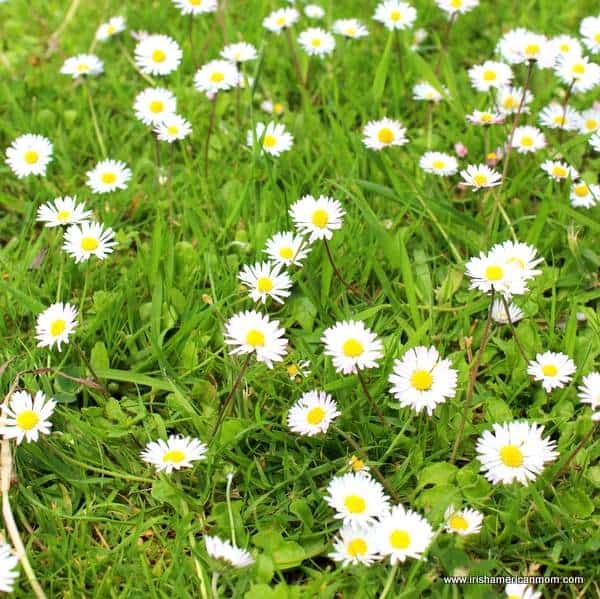 Hi Maureen – When those daisies start peeping up again this spring, keep making those daisy chains for your grandchildren. The simple things in life bring so much joy, and with all the gadgets and games kids play today, I worry they’ll never learn to really play, and appreciate the world around them. I think of all the wonderful life skills, like patience and kindness, we learned as little girls when we threaded daisy chains together. I have to admit, years ago, a friend from Limerick, who was living in Cork, came to visit me in California. I was showing her the beauty of my country, and we came to a meadow, and she made me one of those daisy chains. I was single, a real guy, I was about 30 years old, and I was watching her make one on my wrist for me. Now I am a guy that likes football and sports in general, and I sat there, quiet as a church mouse. Did I enjoy it? I have to say yes, yes and yes again. There is something magical about a pretty girl, with a brogue, making a guy a daisy chain. Looking back on it now, I am a little embarrassed to say this, but a beautiful woman will make any guy into a real jelly fish. Hi Ray – This short film truly does stir great memories for many of us – thanks for sharing your lovely California daisy dreamin’ tale. Loved the ‘Daisy Chain,’ film. I remember making lots of daisy chains on Summer afternoons with all the little girls in our neighbourhood. My parents did not like the daisies to pop up in the front garden–thought the grass needed to be cut right away (with the shears). I missed the daisies here in the South when I came over. Dandelions–Jinny Joes– were great fun to blow on and scatter! Of course we all loved the buttercups! It was great wading in the wildflowers in the meadows close to us, and we did not have to think about snakes! Thank you for sharing this lovely post, Mairead. 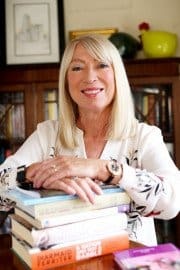 Hi Maureen – Do you remember blowing Jinny Joes away and singing “Jinny Jo, Jinny Jo, bring me back an egg?” Then if you found one with a little seed attached you were convinced the original one had returned successful on its mission. I loved Ireland’s snake-free fields and meadows too when I was a little girl. Just like in the film, I remember being told not to come back into the house if it was still bright and not raining. Such lovely carefree days! 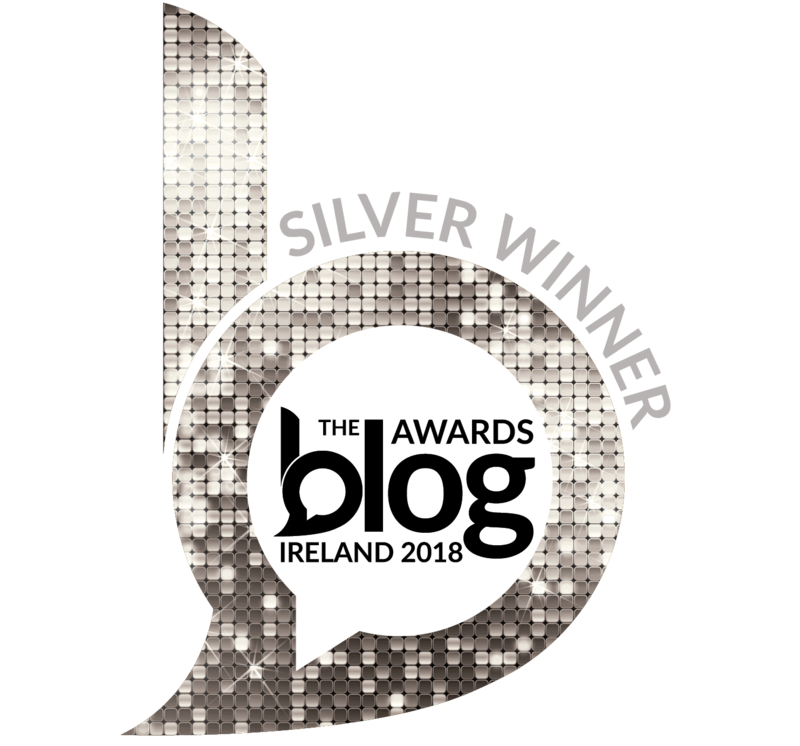 Hi Mairead, thank you for sharing your lovely review of the Daisy Chain and just as it brought a happy tear to your eye, your review brought a happy tear to mine. Hi Rosie – I feel honored that Ken contacted me to share his lovely film on my blog. You must be so proud of your son for writing and creating such a poignant piece about the simple, happy days of our Irish childhoods. His film is just beautiful, and your little granddaughter, Rosie, is cute beyond words. I bet she’s keeping you all on your toes these days. Best wishes, and thanks so much for stopping by. I want to fill my days with beauty such as this. 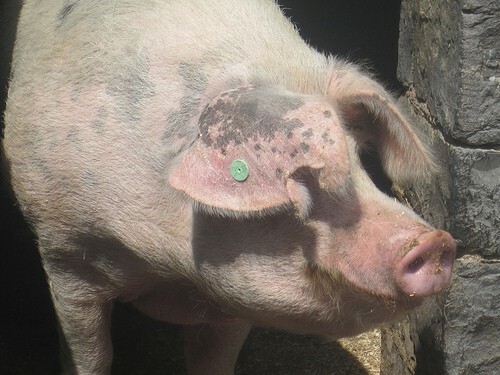 Hi Penny – I often dream of living in a cottage in West Cork looking out over the Atlantic ocean, surrounded by the spectacular beauty of rugged peninsulas. Maybe someday! This film truly shows the town of Schull in all it’s magnificent glory. The good thing is, when we live in a city, far away from such tranquil serenity, a film such as this let’s us dream of and remember the beauty in the world. rose petal fingernails, and brushing fallen pine needles into a floor plan. “Rose petal fingernails” – oh, the good old days. Thanks for making me smile, as I remembered the “perfume” concoctions we would make with the rose petals afterwards. My sisters and I never settled for just rose petals, and boy did we create some never-to-be-repeated scents. How lovely, M! I believe that God constantly gives us peeks of Heaven…this surely is one! Ireland has a way of doing that so easily…outside of ourselves as well as within. Beautifully said, Irishannie. I do feel close to God in Ireland, and without a doubt Ireland does reveal little glimpses of Heaven. Here’s to West Cork cottage dreams. Really glad for this post, Maired. Daisies have always been my favorite, and although I never made a daisy chain (not the thing to do growing up in New York), it seems like it would have been so much fun and a wonderful childhood memory to cherish. Thanks for sharing the story and the video. 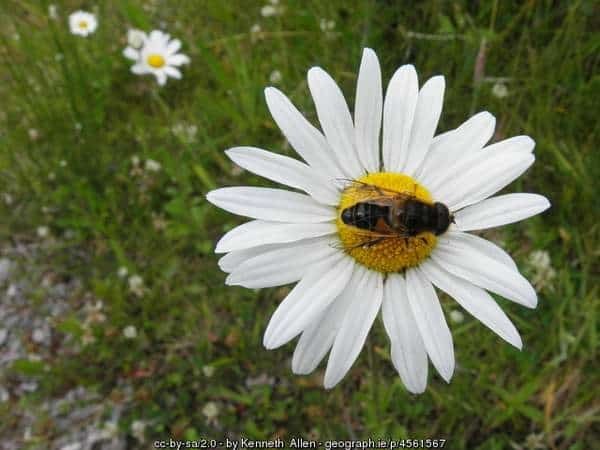 Hi Debbie – Daisies grow abundantly in Ireland. Small delicate blossoms cover the fields in a white hue every spring and summer. There was no shortage in our flower supply for our never-ending daisy chains of summer. So glad you like daisies too, and enjoyed this video. Happy daisy picking with your grandsons this summer Cheryl. I always believe the simplest things in life create the best memories for children. 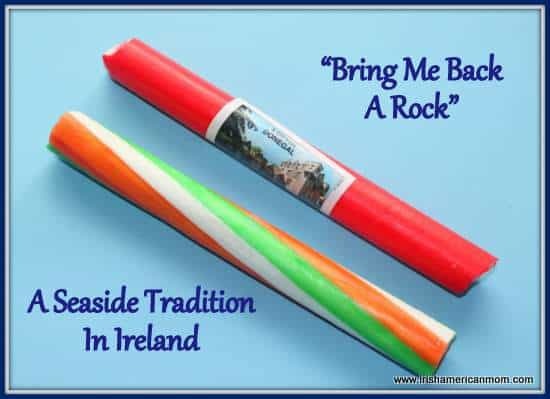 Hi Trish – I’m delighted you found my site, and that this wonderful little film brought back lovely memories of your childhood in Limerick. 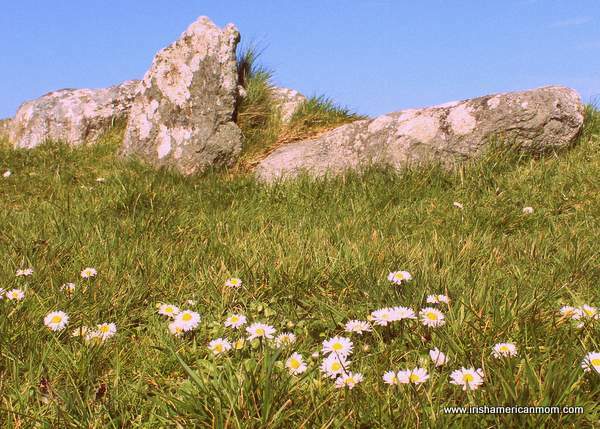 “Nature’s jewelry shop” is a lovely was to describe those Irish fields awash with summer daisies. Do stop by whenever you want to share some memories of Ireland. This was very special to me as well! My grandmother passed away in July 2014, two days before my 23rd birthday. Before we left our house, I gathered up some flowers, and as my husband drove us to my family’s home for the funeral, I made a daisy chain crown and set in on my head. It was something my grandmother would have delighted in, and which reminded of my childhood with her. Thanks for sharing this lovely little film. Hi Allys – Thank you for sharing your beautiful memories of your grandmother, and how you wore a daisy chain on your head for her funeral. How beautiful! This short film has stirred beautiful memories for so many readers. Though simple, it takes many of us on a remarkable emotional journey.